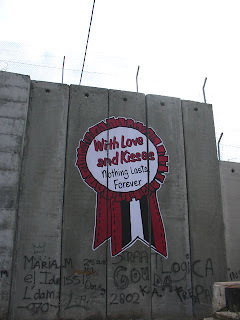 Bethlehem is one of the most contentious places on earth. Perched at the edge of the Judaen desert at the intersection of Europe, Asia and Africa in the state of Palestine it was governed by the British following the collapse of the Ottoman Empire. After World War II the United Nations voted to partition the region into two states - one Jewish, one Arab and there’s been fighting ever since. It’s obviously not the job of a loose collection of idiot doodlers to tell you what’s right or wrong about this situation, so you’re advised to do further reading yourself (this month’s National Geographic has an excellent article all about Bethlehem). We would like to make it very clear Santa’s Ghetto is not allied to ANY race, creed, religion, political organization or lobby group. As an organisation the only thing we’ll say on behalf of our artists is that we don’t speak on behalf of our artists. This show simply offers the ink-stained hand of friendship to ordinary people in an extraordinary situation. Every shekel made in the store will be used on local projects for children and young people. Not one cent will go to any political groups, governmental institutions or, in fact, any grown-ups at all.